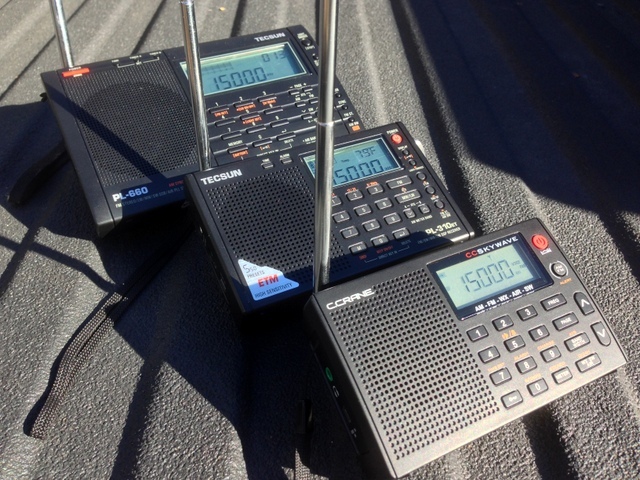 While electronics manufacturer C. Crane offers a number of unique AM/FM radios, including some of the best portable medium wave receivers on the market, they’ve traditionally only had two models of shortwave radio––namely, the CCRadio-SW, and the CCRadio-SWP. Earlier this year, however, C.Crane announced a new portable that would join their product line: the CC Skywave. Admittedly, I was eager to give this little radio a go: C. Crane touts the Skywave as an exceptional travel radio, for which I’m always on the hunt. Last week, I had my opportunity when C. Crane sent me the new CC Skywave sample for review. I instantly got to work scrutinizing their newest offering…and here’s what I’ve discovered. The form factor of the Skywave is very similar to C.Crane’s CCRadio-SWP pocket radio; in fact, its smooth plastic body even feels the same. While this radio doesn’t have the rubberized coating that have become popular on radio exteriors in recent years, supposedly to provide an easy-to-grip surface, I’m pleased that C.Crane does not use this, as these coatings can eventually deteriorate over time and with heat exposure, becoming somewhat tacky or sticky to the touch. The Skywave’s backlit LCD display is small, but readily viewable from several angles. 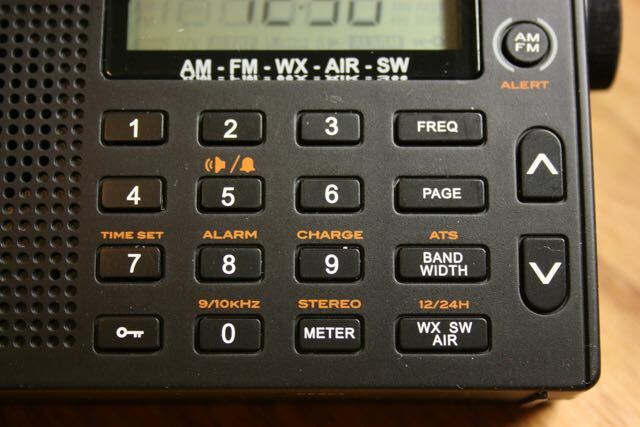 All of the buttons on the front of the Skywave have a tactile response, again, similar to the CCRadio-SWP. The buttons require slightly more pressure to activate than Tecsun and Degen models; I prefer this, especially for a travel radio: should I forget to activate the key lock, it’s much less likely that the radio will accidentally turn on during transit. As always, I attempted first to see how many radio features and functions I could uncover without first consulting the owner’s manual. 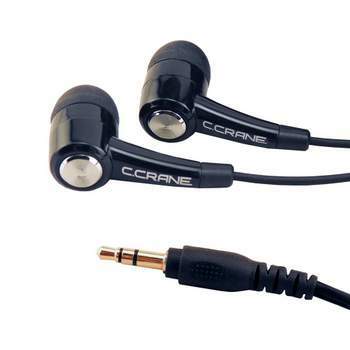 In the past, C.Crane products have been some of the most intuitive on the market. Fortunately, the Skywave did not disappoint: first, I was able to set both the clock and alarm within moments; both essential in a travel radio. I then turned on the radio and found the memory allocation to be very straightforward: tune to the desired station, then press and hold a number button two seconds to save. Press a button quickly to recall. Memory remembers bandwidth, stereo, or mono (if FM), and any voice or music audio filters utilized–very handy! Speaking of bandwidth, the Skywave has five on shortwave, medium wave, and air bands: 6, 4, 3, 2, and 1 kHz. By pressing the bandwidth button, you can cycle through these from widest to narrowest. The bandwidth defaults to 3 kHz, but the default can be changed by holding down the bandwidth button for five seconds (with radio powered off). To enter a frequency in AM/FM/SW, you simply press the FREQ button, then key in frequency. To scan through the band, simply press and hold one of the up/down arrow buttons. Worth noting: the Skywave’s scan function is one of the fastest I’ve seen in a portable. On the topic of scanning, and since this is a travel radio, I would have liked C.Crane to include an ETM function like that found in the Tecsun PL-310ET and PL-380. It’s quite a handy function for auto-populating temporary memories from a simple band scan. I assume this is not an option on the DSP chip powering the Skywave. Once I had my fun trying to discover as many functions on the Skywave without the manual’s aid, I finally opened it and discovered a few more functions. One feature I’ve already come to love in the Skywave: the ability to change the tuning speed, and thus frequency step-spacing on the tuning knob (option of 5 or 1 kHz steps), just by pressing the knob itself. I much prefer this to using a front-panel tuning step button because it’s so easy to operate in low-light settings (lounging in bed, for example). Another unique feature of the Skywave is a switchable audio filter for voice or music. With the filter set to “voice,” the audio is enhanced for human voice intelligibility. When set to “music,” it widens the audio filter, thus optimizing audio fidelity. Toggling the audio filter settings between voice and music is very easy, but not intuitive; indeed, it’s almost a hidden feature you can discover via the owner’s manual. Simply press the “1” and “2” simultaneously while listening to a broadcast to toggle the filter. I should note that the C.Crane owner’s manual is one of the most straightforward and simple I’ve seen in ages. You can tell that, at least in the English version that came with mine, this manual was written by a native English speaker. It made for simple, clear instruction without head-scratching over obscure terms. Even the least technically-inclined user will understand these instructions, no problem. After asking SWLing Post readers what they would like me to include in this review, a number of you responded that you wanted me to give the AM broadcast band reception a proper review. My foray into medium wave listening with the Skywave started off on the right foot. The very first night with the Skywave, I tuned it to 740 kHz, my favorite, albeit challenging to reach, AM station here in the North America–CFZM “Zoomer Radio” While those living in the midwestern and northeastern US can receive Zoomer radio easily enough at night, it is often a tough catch here in the southeast in the evening hours. After nightfall it competes with clear channel stations that also occupy 740 kHz. With a portable radio, the lock on Zoomer is never terribly strong and is very prone to fading. But after tuning the Skywave to Zoomer, I received CFZM so well it sounded like a local station–in fact, I couldn’t believe it until a station ID confirmed that I was receiving it. Even more surprising was that I received it away from home, in an area plagued with RFI noise where I typically have to carefully turn a radio to null out the noise in an effort to enhance the desired broadcast. But the Skywave somehow mitigated this noise better than my other portables. Even when I turned the radio in the direction of the offending electrical noise, it wasn’t as bad as on other portables. Truly, the reception was remarkable. With Zoomer firmly locked in, I hopped into bed, turned the volume to a comfortable level, and listened for at least half an hour before falling asleep. I was pleasantly surprised the following morning, some eight hours later, when I woke to the Skywave playing CFZM at the same level. Phenomenal! Perhaps conditions were exceptionally favorable that night; nonetheless, the Skywave couldn’t have impressed me more. A side note–on the previous day, I’d inserted two generic alkaline AA batteries in the Skywave; after a total of ten hours playing at medium volume, the battery indicator still showed full capacity. While time won’t allow a full audio sampling of the medium wave band for comparison, I did record the following comparison between the Skywave and the Tecsun PL-310ET (which I regard as one of the more capable sub-$100 ultra-compact portables on the market). In the following recordings, listen for Radio Reloj (Cuba)–it’s buried deep in the noise. You might detect the ticking and “R” “R” in Morse code. These recordings were taken within one minute of each other. Note that the Skywave pulled out the dominant broadcaster–one I could barely hear on the PL-310ET. I then made a recording on 990 kHz AM which had a stronger dominant station. To my ear, the Skywave was clearer and the commentator’s voice seemed to pop out of the noise better. I’ve spent a great deal of time listening to the Skywave on the medium wave band this week and I feel comfortable recommending it for the medium wave DXer. While I’ve spent comparatively less time (thus far) evaluating the Skywave’s FM band, I can say that the Skywave receives my “benchmark” FM stations with ease. Sensitivity also seems to be on par with my other DSP based portables (meaning, excellent sensitivity). Of course, being a shortwave enthusiast, I’ve spent the bulk of my listening time since receiving the Skywave on the shortwave bands. And during this time, alas, shortwave radio band conditions have been challenging for any radio. Yet I’m happy to note that this little radio does not disappoint: it has excellent sensitivity and selectivity for a radio of its size. When I compared the Skywave with the Tecsun PL-310ET, in almost every situation, they are nearly equal in performance. Below I’ve included audio samples of the Skywave on 9580 kHz (Radio Australia). Under normal conditions, Radio Australia would be a blowtorch signal here in North America, but this particular morning, propagation was quite poor. In the audio, you’ll hear both radios attempting to cope with pronounced fading, with their AGC circuits reacting to the quick rise and fall of signal strength. Both radios were set to a 3kHz bandwidth and the Skywave’s audio filter set to “voice” to help mitigate noise. Note that Radio Australia was broadcasting music, which can be more difficult to evaluate, but the vocals were prominent enough I felt it made for a good comparison. This morning, I also recorded WWV on 15 MHz. Again, propagation conditions were poor across the bands, so even WWV (normally very stable) was affected by quick fading (QSB). For kicks, I decided to add the benchmark Tecsun PL-660 to this comparison. If you recall, it received some of the highest marks for sensitivity in our weak signal shoot out. The Tecsun PL-310ET and CC Skywave were set to 3 kHz bandwidth and the Tecsun PL-660 to it’s narrow bandwidth (which I felt was most equivalent). The good news is that the Skywave is certainly a sensitive and selective portable. While evaluating shortwave performance over the past week, I’ve been pleasantly surprised by how well this little radio receives. Those of us living or traveling in North America will appreciate the Skywave’s built-in NOAA weather radio functionality. Since I have at least a dozen self-powered radios and desktops that have built-in NOAA weather reception, I typically don’t give the band much thought. I figured NOAA reception would be a mediocre add-on with the Skyview. I was wrong. Not only does the Skywave have NOAA weather radio, but it also has SAME weather alerts. What’s so great about that? Imagine that you’re travelling to a rural area and weather is looking ominous; in this case, you can simply set the Skywave to the strongest NOAA channel and activate the weather alert (choose options for 4, 8, or 16 hours). If severe weather is reported for your geographic area, the Skywave will alert you. 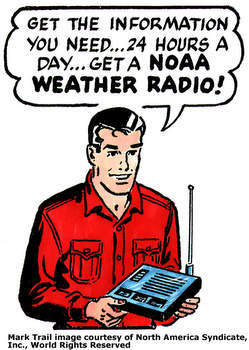 I’m very pleased with the NOAA weather radio reception, as well. The Skywave receives NOAA stations even better than one of my dedicated weather radios. C.Crane included the Air band for travelers, as a means to listen to air traffic control while in an airport or awaiting a flight’s arrival. I have several portables with the AIR band, but most lack an autoscan ability (Grundig G3, G6), and performance on these tends to be mediocre at best. I’ve traveled to three different cities over the past week and used the Skywave to tune to the local air-traffic control tower. After a bit of scanning, it eventually found the frequency, and reception was quite good. I have not yet used the AIR band in an airport (notorious for RFI) nor in a large metro area, so I can’t comment about performance under those conditions. What really separates the Skywave apart from my other shortwave portable with the AIR band is that it actually has an adjustable squelch mode. Nice touch! Unlike Tecsun portables which typically ship with batteries, an external antenna wire, chargers, travel cases, and the like, the CC Skywave comes with very few included accessories––just a carry case, an owner’s manual, and earphones. Most of the headphones/earphones that accompany a shortwave radio package are of the cheapest quality. I’m happy to note that the Skywave’s included earphones are the best I’ve ever received as an included accessory with a shortwave radio. The CC Buds Earphones are in-ear style (which I prefer, for sound isolation) with soft silicone earpieces. They are tuned to a frequency response which favors voice, an enhanced mid-range. For SWLing and MW DXing, I believe they’re nearly ideal. Indeed, I’m planning to use these with my Elecraft KX3 next time I’m operating QRP––I’m sure that SSB will sound great. Since these are tuned for the spoken word, however, I wouldn’t necessarily favor the CC Buds Earphones over my Sony in-ear buds for music listening. Whip antenna is short––only 16” fully extended. While the Skywave seems to perform brilliantly with this short antenna (see pro), I can’t help but wonder if more length might boost some bands. The CC Skywave is nearly identical in size to the late and great Grundig G6. 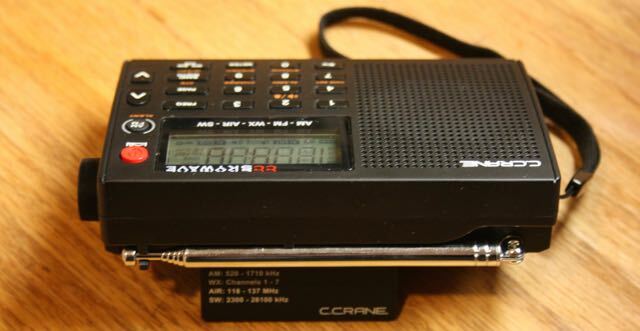 C. Crane has few shortwave radios in their product line, and all perform rather well for their price point; I know, as I have owned all of them and even purchased as gifts in the past. But I was concerned a few months ago when I noted the similarity between the CC Skywave and the poorly-reviewed Digitech AR1733, sold in Australia/New Zealand by Jaycar. Fortunately, it’s clear that C. Crane noticed the shortcomings of the AR1733 and has modified the Skywave’s design and firmware accordingly, which may account for the delayed roll-out of the CC Skywave. Obviously, the Skywave’s ACG circuit has been tweaked to cope with medium wave and shortwave listening, since a poor ACG circuit is one of the shortcomings of the AR1733. But, if so, wow…what a tweak. 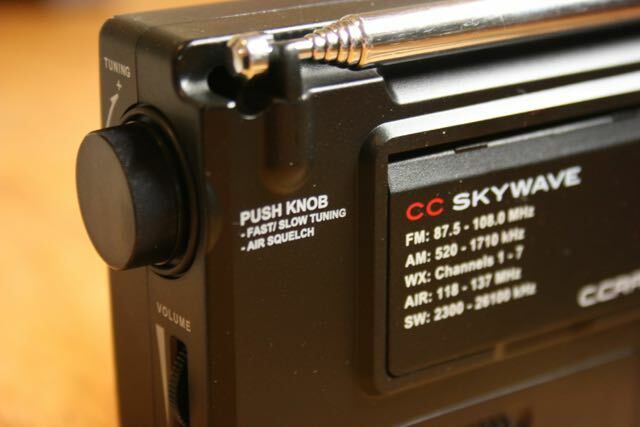 Because all in all, the CC Skywave is a excellent little radio. Indeed, in terms of the ultra-compact portable market (models like I included in a recent shoot-out), I think it’s one of the best surprise performers I’ve seen in the past couple of years. After just one week with it, I’ve already decided to take the CC Skywave along on my travels to see how it performs over time. It will replace my PL-310ET and PL-380 for my one bag domestic and international travelling. The CC Skywave is also especially well-suited for the “go”-bags and “bug-out” bags used in evacuations and other emergencies. Indeed, with AM/FM/SW/AIR plus functional NOAA radio, this little radio packs a lot––in short, the Skywave packs enough to get packed in my bag. The CC Skywave can be purchased directly from C. Crane. It is also available at (soon) Universal Radio and Amazon.com. This entry was posted in AM, Mediumwave, New Products, News, Portable Radio, Radios, Shortwave Radio, Shortwave Radio Reviews, Travel and tagged AIR, BOB Radios, Bug Out Bad Radios, C.Crane CC Skywave, C.Crane CC Skywave Review, CC Skywave, CCrane CC Skywave, Go Bag Radios, PL-310ET, PL-660, Prepper Radios, Shortwave Radio Reviews, Tecsun PL-310ET, Tecsun PL-660, Travel Radios, Weather Radio on December 13, 2014 by Thomas. Best radio I have ever purchased….. I followed up with reference to AM Bleeding first version of Skywave i believe(March 2015). This is the response i got.. Thank you for contacting our company. In response to your inquiry, our CC Skywave has been improved to prevent AM bleedover to the Shortwave band. If we can be of further assistance please email or call our toll free number. 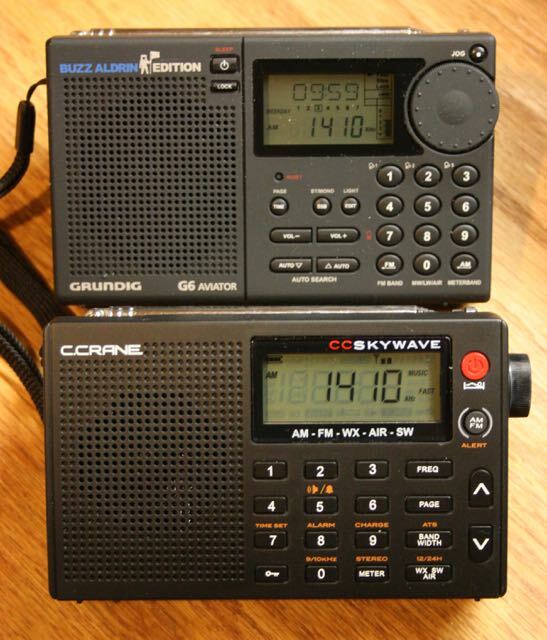 For anyone reading C. Crane has later produced an upgraded version with SSB coverage (C. Crane Skywave SSB). But it is almost twice as expensive! This is the piece which i was finding it .i got . i rally want it .but i dont know how plz help .how it will be available in pakisthan. I am not familiar with shipping to Pakistan. My guess would be though that you woud need to order one through an eBay seller and use their global shipping program. I am guessing that could be pricey, though. The Tecsun PL-310ET is a very good receiver. It could be better if it weren’t for that hideous soft muting Tecsun insists on implementing on its portable receivers. Soft muting causes volume to drop abruptly and audio to be muffled everytime a signal goes under a certain established threshold. The PL-660, a great radio, soft muting acts on signals that read below S2 on its S-meter. The difference being that PL-660 does not have DSP. 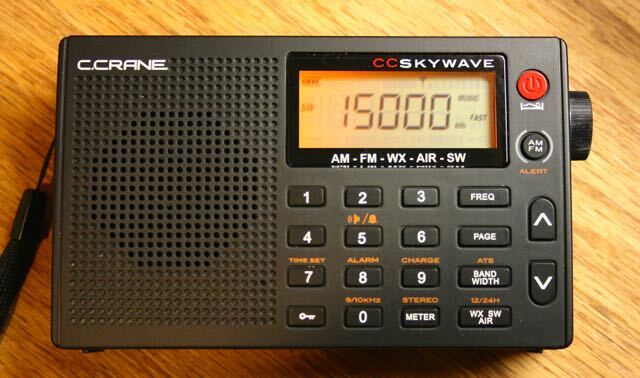 So it is no surprise the C. Crane CC Skywave performs better, specially on medium wave. When soft muting cause the signal to drop abruptly, it does not allow AGC to try and normalize audio as it would normally do on a radio without this feature. That is why I prefer receivers with variable RF gain attenuator. 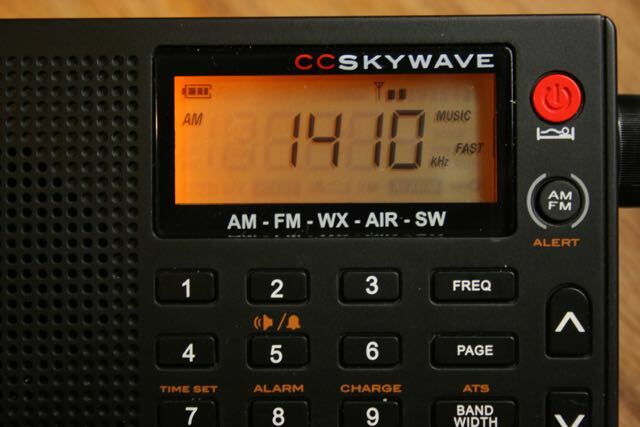 I have owned a skywave for a year or so and I agree it is a fine radio and I use it every day. There is one problem I experience frequently. The skywave is supposed to be able to recharge nimh batteries by pressing 9 and holding (with radio off and USB power on) and although it appears to try for a few seconds, it then gives up the ghost. A small but annoying failing which forces me to take out the batteries, often losing settings in the process. Thanks, Jerry! If you haven’t already, you might call or drop C. Crane an email about this. I bought a C Crane radio direct a couple of years ago. Outstanding AM & FM performance, though it consumed batteries like nobody’s business. The kicker for me was the thing fell apart after a few weeks light use – very flimsy piece of gear. Never again. I had a similar experience with the CCRadio-EP. 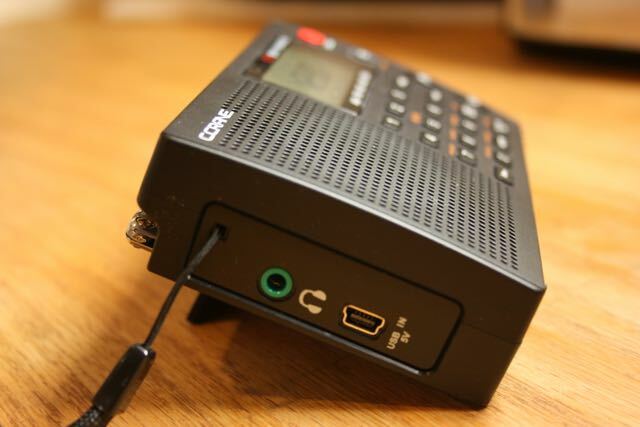 Mine malfunctioned after six months, and Crane would not help me beyond offering me a new radio at 10% off the standard retail price, because I had not purchased the CCRadio-EP from a source they deemed to be an authorized dealer. My problem with radios of this design, is there is no option to keep the light on. Seeing the dial lit is part of the radio experience. I grew up with radios, portable and home, that all had lit up dials that remained lit. No 10 second timer. I know this was back before digital radios. But c’mon. It’s a simple thing, why not have the option to keep light on? The battery life of my skywave is only 9-10 hours with 2 alkaline batteries even less last days. I have read 60-70 hours with moderate volume. what can I do? , some advice will be gratefull. Thank you for evaluating the front end overload issue.for that reason I am not buying the skywave.with your good advise I purchased other radios. I would not buy a radio without your recommendation. Thanks. Glad you found a radio you like. FYI: the latest version of the Skywave no longer has the overloading issue. They fixed this a few month after my review was published. I look forward to and respect your evaluations on all matters concerning sw. Keep up the fine work. If you are looking for a good smaller format portable AM/FM/LW/SW radio, with SSB, the best choice is the Sony ICF SW7600GR. I have owned one of the 7600s for more than 10 years and I can listen to ham radio signals on all ham band with no,problem. CW is OK, but it can be hard to separate signals as there is no CW narrow filter. They run about $140 on Amazon, but can probably found for less. No WX and no air and, but great on AM, FM and SW.
An all-time classic, but at 15+ years, rather old technology for the price. I still use mine for AM and occasionally SSB, but the FM is too wide to capture adjacent signals. While it’s very well made, I prefer the Grundig/Eton G5 or G3 in that class. The Skywave utilizes the DSP chip with other capabilities not found in the Sony or Grundigs. I agree with your comments on the 7600GR as to being somewhat outdated technology. I still think it’s a good RX for general coverage and it does have wider band coverage than the Skywave. If the Sony can be found in good used condition at a price at ot near that of the Skywave, I’d still get the Sony. This is a question rather than a comment. Is the CC Skywave dual conversion? The number of conversions in itself means nothing. A single conversion to 455KHz will generally not have good image rejection, especially the higher in frequency you tune. But some legendary receivers like the HRO had less problems because it had quite good front end selectivity. Lots of receivers now convert to a frequency above the shortwave range, such as 45MHz. That is high enough that image rejection is easy. But it’s not cheap, and maybe not easy, to get good IF selectivity at that frequency. So a second conversion is needed to get to a frequency where selectivity is cheap, such as 455KHz. There was a whole wave of receivers that went to double conversion so each band could be small (like 500KHz) and consistent, meaning calibration was good and the same on each band. But in those cases, like the Collins 51J3 or the Radio Shack SX-190, another conversion was needed ahead of that single band receiver to tune in the other bands. The extra conversion was related to tuning rather than image rejection; with synthesizers, the workaround isn’t needed. Receivers using the Wadley Loop require three conversions, but one conversion is just part of the “synthesizer” scheme. Likewise there are some recent receivers that didn’t need more than a single conversion for image rejection or selectivity, my Kenwood TS-830 transceiver comes to mind, but which adds conversions for passband tuning, or some other “bells and whistles”. A receiver needs good image rejection, there are now multiple ways to that end. Counting conversions won’t tell you directly how god the receiver is. Excellent explanation in a comprehendable need-to-know fashion! Thanks! Did C Crane get the AM bleed over on the SW band fixed? Thank you! I appreciate the link and your fantastic blog. GOOD LUCK WITH TRYING TO GET SOMEONE TO GIVE YOU AN AUTHORIZATION NUMBER FOR YOUR RETURNS…. STILL WAITING. What is wrong with your radio? Hi, I have had no luck with getting anyone to give me an authorization # for a return. I HAVE CALLED MULTIPLE TIMES AND LEFT MESSAGES AND HAVE SPOKE TO AGENTS THAT ANSWER THE CALL WHEN I HAVE USE THE # 3 WHEN PROMPTED AND THEY TELL ME THAT THIS WHOLE ENTIRE DAY HAS BEEN WAY TOO BUSY FOR AN AGENT TO HELP ME WITH MY TURN. I WOULD NEVER PURCHASE ANOTHER PRODUCT FROM C.CRANE DUE TO THEIR POLICIES ON RETURNS. THE RETURNS SHOULD BE AS EASY AS THE PURCHASE WAS. the inconvenience and we are working to restore to full services. There may be some delays on customer service and technical support related calls. You can still place an order or a catalog request by calling 800-522-8863 or through our website. This may explain your problems. I just wanto to learn your view on a point. Regarding just am (mw), how does skywave perform compared to de (ka) 1103? I have never compared the two side-by-side, but I think they would have similar performance on the shortwave bands. The Skywave may have a slight edge. The 1103 does have SSB reception (the Skywave doesn’t). The Skywave has features the 1103 lacks, though, like variable bandwidths. Personally, I prefer the Skywave over the 1103 (if I had to choose) because I like the form factor and ergonomics. The 1103 is still a popular radio, though. Great review – I enjoyed the read. Do you have any info on using lithium batteries with the CC Skywave? C.Crane recommends not using them due to “higher voltage and/or amperage”. My meter reads 1.55 for a new alkaline and 1.65 for a new lithium, so was just wondering if 1/10th of a volt higher would matter. Thanks! MW: The Skywave is far better than any of the Tecsuns and is almost as good as the C Crane 2E (my best MW receiver). At my location (40 miles N of Chicago), the distant groundwave fringe includes WLW, WJR, and KTRS (St. Louis) – in descending order of reception potential. Most radios can get a whisper of WLW (though not discernible), while the other two are rare. The C Crane 2E gets WLW and WJR well enough that you can listen; KTRS is detectable. The Skywave gets WLW and WJR and you can tell that KTRS is there. That indicates that the Skywave is among the best. And there are no birdies nor whistles on the band. Nice. FM: Just as sensitive and about 99% as selective as any of the Tecsun DSPs. The shorter antenna doesn’t seem to hamper reception at all. And, with no soft muting and a more logical tuning setup, it’s a pleasure to work with. Lastly, the stereo reception threshold on the C Crane DSP chip is significantly lower than that on any of the Tecsun rigs, so most signals decode stereo and simply sound better. Where I live, I have tons of signals that are 0.2 MHz apart (i.e. 101.9 Chicago, 102.1 Milwaukee, 102.3 Waukegan – and local) – the Skywave has no trouble separating these and providing a usable signal for all three. SW: Seems to do just fine. I have not had any overload issues with my unit and can pull in all as many SW signals and most of my other small portables. The lack of SSB is an inconvenience, I suppose, but I guess you can’t have it all! WB: This band is great to have and is perfectly functional. I will say that this isn’t my most sensitive WB radio, but it’s not deaf by any definition. It’s just a little less sensitive to distant fringe WB stations than some of my other sets. But it does dependably pull in anything within 60 miles, so we’re only talking about ability to pull in distant fringe signals (which can be fun). Air: I’ve played around with this a little and it definitely works better than expected. O’Hare tower is about 25 miles away and I get it clearly, along with aircraft that are (from what I can tell) basically anywhere within about 60 miles. The ability to scan is very helpful; however, catching a signal when someone is broadcasting is tricky. A little online research into local ATC frequencies goes a long way toward having fun on this band. The Skywave seems to work the Air Band better than the G6 and G3, my only other radios with this band. So, overall, this radio has been a very pleasant surprise. No disappointments whatsoever. Kudos to C Crane Company for doing such a fine job with yet another radio. So is the issue that MikeG reported (overload of the front end when in the Shortwave mode) a known defect in all current Skywave radios? I’d like to know because mine is set to arrive from Amazon tomorrow. Yes, this appears to be a defect in all current Skywave models. But, it’s really location dependent, so you might have a perfect experience with the Skywave, where as I ended up returning it. I’ve been using this great little Radio for about 3 weeks now and I’m still very impressed with its performace. Its had a lot of use and the battery indicator has just dropped one bar (its a 3 bar indicator) but performance is still the same. I’m using Duracell Alkaline batteries (2x AA size). Last weekend I was in Melbourne and used the Air Band, It was interesting listening to Melbourne and Moorabbin Airport Control Towers talking to Aircraft. I have made my temporary outside aerial longer and more permanent and installed an aligator clip to clip onto the AR1733’s aerial which greatly improves the shortwave and FM reception. This is a great little Radio and at $59.00 AU from Jaycar Electronics I think its great value for money. Can the various cellphone type external power packs be used (recharge/power) with USB charged radios like the Skywave? I’ve had an interest in listening to radio broadcasts for a while now and have been using a Sony AM/FM small portable. But I wanted something better with shortwave but still small in size as I take it with me on my motorcycle camping trips. So I surfed the net and found this and other web sites about DXing. This is all new to me but to cut a long story short, I purchased from my local Jaycar outlet in Victoria Australia a Digitech AR1733. What a great little Radio, at this stage it does everything I wanted in a small AM/FM/SW Radio. I got a length of speaker wire, split it in half, joined the halves and flung it up into a tree in my backyard and ran the other end into my house. I wrapped the bare wire around the telescopic aerial. Last night I recieved Nashville USA, Bejing China, and Tokyo Japan as well as many others. I am really impressed with the Digitech AR1733. Of course I cant compare it to other SW portables as I have not used them and I’m guessing that at some stage soon I might purchase a larger portable that also has SSB and more features. But for now I can highly recommend the AR1733 for beginners like me, Its a little beauty. Also thanks to Thomas for his Excellent Reviews on SW Radios. Very good comments from most everyone. Enjoyed them all -THANKS. Thomas, as we chatted about over email, I’m posting about the issue I had with the C Crane Skywave front end overload issue. I was excited to purchase this radio, as I was looking for a more compact shortwave portable for travel/hiking. I also liked how the Skywave has the WX and airbands too. But, unfortunately after receiving the radio and powering it on for the first time, I immediately found that it can suffer from front end overload. I live in Pittsburgh on a hill, and can see a few radio towers on other hills in the distance. I wouldn’t consider myself “living in the shadow” of a powerful station, but they are directly in my line of sight several miles away. When tuning the Skywave on shortwave, I would hear a local AM station bleed through, no matter where I was on the dial. I’ve heard it on WWV 5000, 10000, 15000, as well as a number of shortwave broadcast stations. Day/night didn’t seem to matter. I also observed overload on the airband, hearing a local FM station on some frequencies. Thank you for contacting our company. This is the response from our engineers: We were recently made aware of the overload of the front end when in the Shortwave mode upon receiving. This is the first production run for the CC Skywave Radio. We are currently working to find a fix for this problem. I apologize for the inconvenience. Please let us know if you choose to return the product. Thank you for your time and patience. So, it appears that this first run of Skywave’s does suffer from front end overload. So, unfortunately I’m returning mine. If they solve this issue I’ll look into purchasing it again, as it seems like a really nice radio for the majority of people out there. Like Mike mentioned. I did face the overload problem of AM station when listening on to the SW frequency. I called the C.Crane customer support and did get the same response they are aware of this overload problem and are planning to fix it in the next production run(and they are not aware when the fix will be done it could take 6 months or a year). Since i primarily use it for AM (some times for FM) I decided not to return it and keep the radio. Will ccrane simply update the firmware to enable a fix to this problem? Since the radio contains a USB input – I wonder if a firmware update could be done by the user. I believe the USB is only for power, but I could be wrong. When I had the radio in hand I didn’t try connecting it to my computer. Made the plunge and bought the Skywave last week. Overall, as the review indicates a nice, well-performing little radio. I found its SW reception comparable with the Tecsun PL-310ET. Not much of a MW DXer so I’ll have to take Thomas’ word on its superiority to the 310 on that band. WX reception was pretty good as was the Air. Only glitches I noticed was that the Automatic Tuning System (ATS) didn’t work on the Air band as stated in the manual – I know others have found this out too but it’s a shame since it would be extremely useful on the Air band. Also, even though I dislike key beeps I couldn’t get the beeps enabled by pressing the “3” button while the radio was off as the manual instructed. Addition of the Air and WX bands are nice extras but with performance roughly comparable to the Tecsun PL-310ET I’d have to recommend the Tecsun over the Skywave (unless you really are into WX/Air) given that the 310ET is roughly half the price of the Skywave. Still a cool little radio for sure. I bought a Skywave and it is fun, well-built, and and I love it! The earbuds are great. I purchased the Skywave as a xmas present for myself. I heard a beep, and lost all of my settings and presets. I had fresh batteries in radio in less than 10 seconds, so I don’t know the reason. I did leave a message for C Crane site also. I’ve changed the batteries on mine 4x. Twice, it reset to 12:00 (but kept the presets) and twice, nothing changed. Got me. Pressing 4 and 6 will reset this radio. Maybe they got pressed while you were installing the batteries? As to the the PL380’s suitability for travel, considering the extreme fragility, I would have to say No. One slight bump of the unprotected volume and/or tuning dials on the side will permanently snap the shafts off rendering the radio useless. Not a good trait for something on the go. And no, I did try to re-attach the shafts with plastic glue on the volume (fail) and super (gorilla) glue on the tuner (also fail). Both are just too small. The cost does not warrant return, so a total loss. Shame too, I really liked that radio. I bought one for my Father in law. When I compared it to my Tecsun PL-380 I found the Skywave’s FM to be better, but AM worse. This is the opposite of what I expected given the Tecsun’s reputation in those areas. 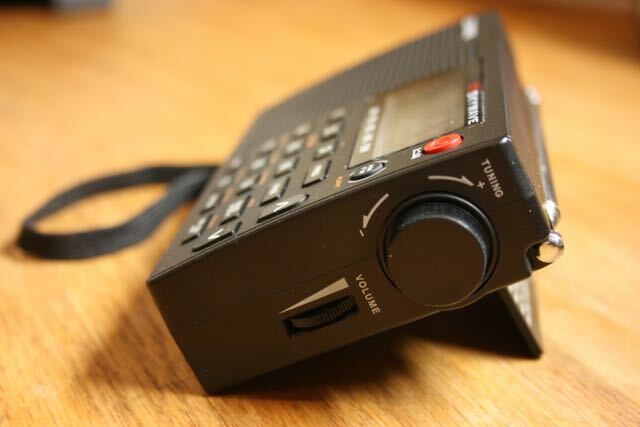 Tecsun’s shortwave came out ahead. It was only a quick and dirty comparison done in my kitchen, though. 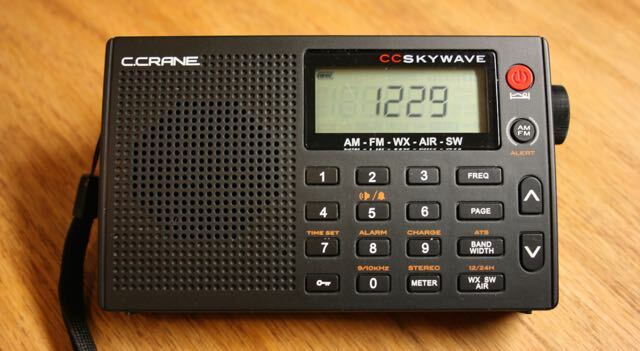 Thomas, thank you for this very informative review of the new C.Crane CC SKYWAVE radio. I appreciate your early review of this recently released model. As a ‘collector’ of small portable radios the SKYWAVE looks like a very compelling addition to my collection. I’m particularly interested in the radio having the NOAA weather band with SAME alarming, usb charging, and the analog volume control. The radio looks like a likely replacement for my TECSUN PL-380 travel radio and/or my PL-660 bedside radio. Now to just order one without the wife knowing…. Thomas this was such a helpful review!! Thank you! !…BUT now i am going to buy YET ANOTHER radio which i need like another hole in my head!! I could sure use some advice finding someone in my area (30907) to help me learn more about my collection and how to do minor repair and tune up. But back to this review I too am looking for another travel radio with good AM and the Weather and Air Band are exactly what i wanted in a travel radio. Thank you again for taking your time with this review and for this excellent site. Thomas thanks for the detailed review of C. crane skywave. I have 2 of them in pipeline including 310ET including skywave. I am waiting for couple of reviews before ordering this radio. PS: Please ignore the negative comments from some readers you are doing a great work and keep doing it for followers like us. Thank you for the thorough review! I really wanted to get more information on this before buying it, and now I’m convinced. Special thanks for the sound comparison with the other radios. Considering you only had a week, this review had the detail I really was looking for. I’m less persuaded by Karl’s comments. This would be similar to saying that Apple or Google are not manufacturers. True, their products are made by outside vendors, but they control all the variables (and are liable for their performance). The CCrane SW is similar to Kaito, Grundig, and Eton models, but only CCrane has the Twin Coil antenna which they have the patent on. Yeah SSB is required for me. You need it to listen to ham, and as well as many other interesting stuff such as military, hf aircraft, spy/numbers stations, and many shortwave pirate radio stations. I can’t imagine getting a shortwave radio now that can only listen to commercial AM shortwave. I agree: SSB is a necessity. Could you recommend a comparable radio that can handle SSB? As someone who has an interest in AM distant stations and a radio with presets, so I can manage it in bed in the dark, I appreciated your in depth review. I was looking at reviews of various models recently, and I was waiting for some detailed reviews of the SKYWAVE because it seemed to have the size/functions I wanted/needed. My main concern was with the AM reception. I had returned the CC pocket earlier this year, as I was disappointed with the AM. I have an old, old Radioshack AM/FM radio that actually pulled in distant stations better than the CC Pocket. I really appreciated that you took the time to record some samples also, so the reader could actually hear the differences in the broadcast. Again, thanks very much for your very detailed review and pros/cons. I think I’m going to order one now, or ask Santa to drop it by for Christmas. Thanks for taking time to do this helpful review. My only problem with it is that I just bought a PL-310, which I really like, but now I wonder if I should have waited for the CC Crane! Oh well, it’s like buying computers back in the 90s when no matter what you bought something better would come along in two months. I have the PL-310ET also, plus dozens of other portables. The review was good but I realize I should sell 10-20+ radios before I buy this. Selling radios used is so hard, no guarantee you can get 2/3 of what you paid, plus high shipping costs, plus fees if you sell on eBay or Amazon. Think the ham sites are free? Karl, I see your point about CCrane but let me ask, who is left here in the West who is actually designing and manufacturing shortwave radios? We have two offerings from Sony (7600GR and SW23), a few offerings from Sangean (Taiwan – do you consider them “West”? ), and everything else is from China, rebranded, or under their own brand. Both Eton and CCrane are marketing companies, with a token engineering staff to oversee the outsourcing, and provide some technical input on features, performance, and look and feel. No real design of consumer level radios happens in the US or Europe. Even Sony’s newer shortwave offerings (which are only available in Europe (example: Sony ICF-M780) are made in China! Eton already has revenues in excess of $100 million (first hand info I have); why would they bring expensive design and manufacturing back to the US? Do you or anyone else here know if the Sony ICF-M780 is any good? Karl, Thomas is as close to a professional reviewer we have (together with Dave N9EWO). And they are doing this unpaid, because of a love of the hobby. In fact I’m sure it costs them quite a bit in terms of time and money to keep their sites going. Instead of calling the review a “fluff”, which is not, why don’t you do a constructive (and polite) critique? Yes, CCrane is not a ‘manufacturer’, but they had a technical hand in improving the AR-1733. And AR-1733’s shortcomings and weaknesses have been pointed out and are well known. Perhaps you can order a Skywave from CCrane, review it, and then send it back if you don’t like it. They have a 60-day return policy; plenty of time for you to do a “non-fluff” review. Paul, I apologize for any “snarky” comments I may have made. Once again, it would be of little sense for me to review this radio, with my strong bias against CCrane. I simply couldn’t be fair. As to Thomas himself, I do apologize if you feel I have called your ethics into question, and I do appreciate your work. However, I hope you can at least see some validity in my position, as regards the re-branding of foreign products and the damage it has done to legitimate designers and manufacturers. OK, you’ve announced your bias against CCrane. Seems more a personal vendetta than simple bias, since you’ve decided not to validate your statement with any hard facts. Perhaps you harbor ill will from the 2003 incident between CCrane and RadioLabs. The animosity must continue to linger among the principles involved. So, no, they don’t make the plastic parts and other hardware in CA, but they do make modifications to circuitry and development, much like Eton does to various Degen/Tecsun models. That’s the more accurate portrayal of the process than a simple rebadge. That describes RadioShack near the end. I don’t agree this is a fluff piece. I’ve read all reviews available on this model and they all seem to be very close in assessment of this radios pros and cons. And once I’ve had the chance to play around with mine for a few weeks, I’ll be eager to share my unbiased thoughts with the masses. I’ve bought and used many, many radios over the years. While I’m not on the CCrane bandwagon, it is nice to see a company still involved in bringing new and improved radios to the market. Thank you for this helpful review. This radio seems to be simpler to use than the Grundig G8 Traveler II. Hi, David, it is a simple radio to use, but has more features and bands than the Traveller II, so not an “apples to apples” comparison. Good thing is that all of the features on the Skywave are pretty intuitive. Right from line 1: “While electronics manufacturer C Crane…”. MANUFACTURER?…really? Does re-branding with alleged “tweaks” (dubious and questionable) actually entitle a seller to call himself a manufacturer? Follow that with “the similarity between the CC Skywave and the POORLY-REVIEWED Digitech AR-1733…”. Poorly reviewed…really? I’ve looked, and have yet to find a poor review for the AR-1733. Pretty much the “fluff piece” I was expecting. Maybe C Crane will send you a review sample or you could order one, spend a couple of days or a week with it and give us a counter review? Thomas, if you have indeed deleted my comments, fine. That is within your authority. However, I take exception with being referred to as a “troll”. I am not questioning your ethics, but rather the quality of the content in your piece. If you would like to continue the discussion, fine. I’m available. Hi Ken. I honestly have no interest in reviewing this radio. As you can tell from my comments, I am strongly biased against CCrane company, so my comments would be skewed against them anyway. That bias extends to other re-branders that claim “manufacturer” status. My real point here is that legitimate designers and manufacturers, especially here in the west, are suffering while “re-branders” prosper. Let them be known for what they are. The real manufacturer of many of these radios, is Desheng in China, and marketed under many different brands. Some are excellent products, others not so great.